Only two weeks ago, with Old Dominion careening toward perhaps its worst season in the school's 36-year Division I history, athletic director Wood Selig gave a seemingly firm vote of confidence to longtime coach Blaine Taylor. "His coaching reputation is an outstanding reputation," Selig told the Virginian-Piliot. "This is just unfortunately one of those years even the great ones have." By Tuesday, Selig apparently changed his mind. The day after Old Dominion lost its 10th straight game to fall to 2-20 this season, the third-year athletic director announced at a Tuesday afternoon news conference that Taylor has been fired and longtime assistant Jim Corrigan will serve as interim coach for the rest of the season. The midseason firing comes as a surprise both because of Selig's recent vote of confidence and because of Taylor's success the previous eight seasons. Hired in 2ooo to rebuild a program that had fallen under Jeff Capel, Taylor turned Old Dominion into a perennial CAA contender known for physical defense and dominant rebounding. The 12th-year coach won 20 or more games seven of the past eight seasons, reached the NCAA tournament four times and made the round of 32 with a first-round upset of sixth-seeded Notre Dame in 2010. Considering that track record and Taylor's school-record 239 all-time wins, it's natural to wonder whether something besides one uncharacteristically bad season may have played a role in his abrupt dismissal. One possibility is his eyebrow-raising appearance on a Jan. 21 coaches show during which he repeatedly stumbled over words and rambled aimlessly on several topics. Old Dominion pulled the YouTube clip citing copyright infringement after it began making the rounds on social media, but Deadspin recovered it and posted it Tuesday. Selig confirmed in his statement to reporters that the firing was "not based solely on wins and losses" but declined to offer specifics, only stating that players needed "mentorship, leadership and guidance" that Taylor was no longer providing. Whatever the reason for Taylor's firing, it seems unlikely it would be solely a result of Old Dominion's performance this season. It was no mystery the program was likely to struggle considering the talent lost from last year and the youth on this season's roster. With all-conference wing Kent Bazemore and double-double threat Chris Cooper both gone, seven newcomers to integrate and the program ineligible for the CAA tournament, the Monarchs were projected to finish in the middle of the CAA. Taylor's best teams have been junior- and senior-laden, but this year's injury-riddled roster includes three true freshmen who play significant minutes. As a result, the Monarchs have struggled in every area besides offensive rebounding, the longtime staple of Taylor's program. They're 330th in the nation in field goal percentage (38.7 percent) and 337th in 3-point shooting (27.5 percent), both areas where the Monarchs have historically struggled, albeit not to this extent. More surprisingly, they're allowing opponents to shoot 46 percent from the field and allowing 1.08 points per possession, both among the worst in a CAA that is as weak as it has been in years. Before the season began, Taylor was optimistic his team could exceed expectations. 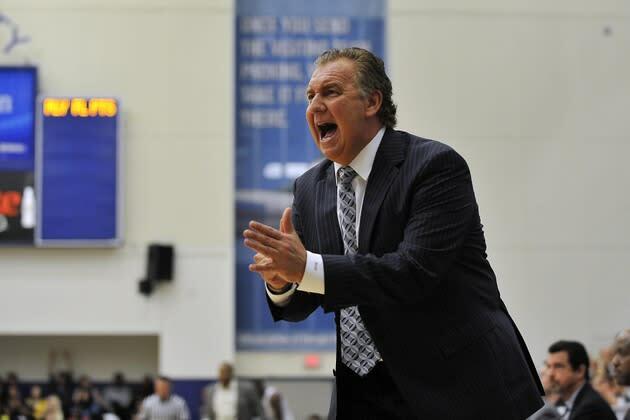 He even printed "Mission Possible," t-shirts for his players so they'd strive for a conference title and an NCAA bid even in a year when the Monarchs were ineligible for the CAA's automatic bid because they're leaving for Conference USA next summer. "We adopted the motto because it's a challenging mission," Taylor said. "We've been in the NCAAs four times in the last eight years, and all four times we'd have gotten an at-large berth. Three times we won the tournament and we didn't need it. The other time we got that at-large. That gives the kids and maybe our followers a little confidence that if the right stuff happens, why not us." Alas, the mission was too difficult for the inexperienced Monarchs. And now they'll have to finish it without Taylor.